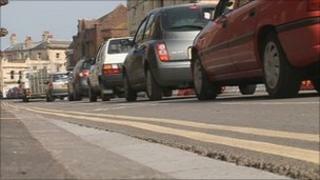 A major new road scheme for Taunton has been given the go-ahead by the government. The £21m Northern Inner Distributor Road (NIDR) will connect Staplegrove Road to Priory Bridge Road and aims to ease congestion in the town centre. Other benefits from the scheme include new bridges and carriageways and new pedestrian and cycle facilities. Somerset County Council said the decision "could unlock" 3,600 new jobs and see 900 new homes built. Cabinet member for physical regeneration, David Hall, said: "Today's decision is a massive boost for Taunton and the wider Somerset economy at a time when it's really needed. "It shows that the government recognises the potential for growth in the county." The Department for Transport has committed just over £15m to the scheme, while the county council will look to make up the difference with developer contributions. Some £4.3m has already been received from developers to build the section of the road between Taunton station and the new Firepool development. Work on the other sections of the scheme is likely to start in April 2012.